It was 25 years ago when major record label reps came to town to scout local bands such as Inch, Lucy’s Fur Coat, and Truman’s Water. San Diego was called the “next Seattle,” suggesting the local scene could produce a phalanx of heavy hitters just as Seattle birthed Nirvana and Pearl Jam on cue two years earlier. It never really happened here. But one local label/distributor, Cargo Music, glowed for a few years as the home of many of those hot bands, such as Rocket from the Crypt, Drive Like Jehu, and Uncle Joe’s Big Ol Driver. While Cargo did cash in with blink-182’s Dude Ranch, by 2010 the label was toast. Two of those Cargo bands were Rocket from the Crypt and Drive Like Jehu, both launched by John Reis. Rocket drummer Mario Rubalcaba says he has “no idea” what happened to the masters for those Cargo releases. Not thrilled with Cargo, Reis launched his own label, Swami Records. Its first release was 2000’s Automatic Midnight, by Hot Snakes, the garagey yet complex side-project he formed with his longtime fellow singer/guitarist/songwriter Rick Froberg. The two formed Pitchfork in their teens and also fronted Drive Like Jehu. Three Hot Snakes records were released on Swami before the band broke up and Froberg moved to New York to pursue graphic design and form the band Obits. 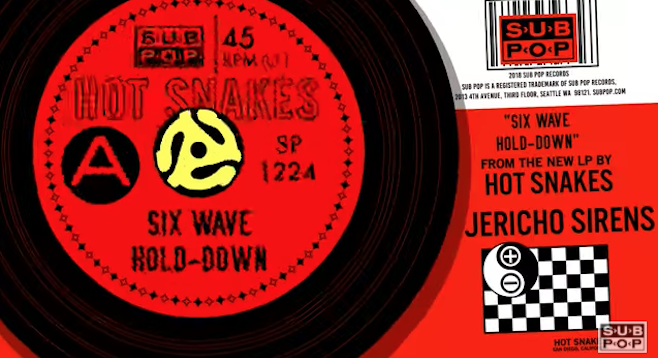 Last year Sub Pop Records, the Seattle label known for its success with Nirvana, Soundgarden, the Shins, and the Postal Service, announced it would be re-releasing the three Hot Snakes records on CD, vinyl, cassette, and all digital formats. Bassist Gar Wood shows off his tube-riding style on the new Hot Snakes record. Wednesday, March 7, 2018, 8 p.m. The drumming duties for Hot Snakes are shared by Mario Rubalcaba (Earthless, Rocket from the Crypt) and Jason Kourkounis (Night Marchers). Froberg, still based in New York, will reunite with the Hot Snakes for the March tour. Sub Pop’s Jacobs says he expects more 2018 tour dates to be announced. The label celebrates its 30-year anniversary with a free outdoor festival in August.